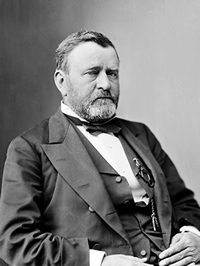 Ulysses S. Grant has had some bad luck when it comes to how he is remember. If he could have bypassed the Presidency and just been the man who won the Civil War, history would have been so much kinder to him. Instead, though, Grant has landed right in the middle of the most controversial presidents list. Although his tenure in office is oftened labeled one of the most corrupt in U.S. history, Grant was never personally involved with any of the scandals and his honesty and integrity was never questioned. His story is really of a man who never wanted to be president — one who admittedly did not have the political savvy to be in the country’s highest office. The Whiskey Ring: Before being exposed in 1875, a group of mostly Republican politicians siphoned off millions of dollars in federal taxes on liquor. Credit Mobilier: Credit Mobilier was a fraudulent, private construction company that stole from the U.S. government by padding federal contracts and also skimmed profits from the Union Pacific Railroad. The scandal involved several Republican politicians including the vice president. According to the University of Virginia’s Miller Center, though, Grant did do a few things right. …in the areas of Native American policy, civil service reform, and African American rights, he took steps that few had attempted. He also executed a successful foreign policy and was responsible for improving Anglo-American relations. The initial S in Grant’s name means nothing — his full name is actually: Hiram Ulysses Grant. Quite a few book have been written about the 18th president of the United States and a great resource for book reviews about Grant — or other U.S. presidents — is the blog, My Journey Through the Best Presidential Biographies. The blog author has reviewed several books about Grant which you can read here.>> You can read the Personal Memoirs of Grant free, here.